Moscow, November 22, Interfax - Patriarch Kirill of Moscow and All Russia hopes to take further joint steps with the Catholic Church to restore peace in Syria. “We are ready to further work with the Roman Catholic Church, with its representatives, in order to jointly do everything to end the suffering and for people to return to peaceful life,” the patriarch said at a meeting with the head of the Pontifical Council for Promoting Christian Unity, Cardinal Kurt Koch, in Moscow on Tuesday. Hopefully, the war will end and “the issue of rebuilding Syria will stand up straight,” he said. “For Christians it will also be important that churches are rebuilt and people can return to their normal religious life,” the patriarch said. It is regrettable that “the two existing anti-terrorism coalitions still don’t have the proper coordination necessary for the fight to be successful,” the patriarch said. “The only way to really defeat terrorism is through coordinated actions aimed at attaining concrete goals,” the Russian Church leader said. 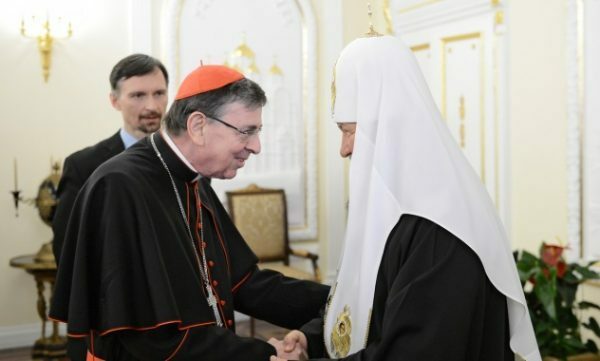 Since his meeting with Pope Francis in Havana in February of this year “there has been high-level talk in various countries about genocide of Christians in the Middle East, and this topic has now moved to the very core of the political agenda,” the Russian patriarch said.